Almost all school lockers are made of steel, but the strength of the steel varies. Remember—the lower the gauge, the stronger the steel. You'll also find that the door material is usually stronger than the body, as doors tend to take more abuse. Also consider whether or not the steel has been processed differently or treated with a particular finish. 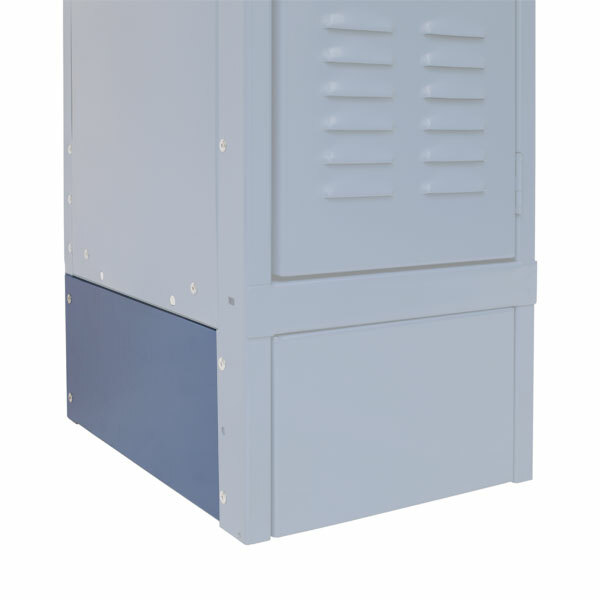 For instance, there is a line of lockers that use a specially processed steel to resist corrosion in high humidity settings. You can order most lockers assembled or unassembled, but certain models only come assembled. 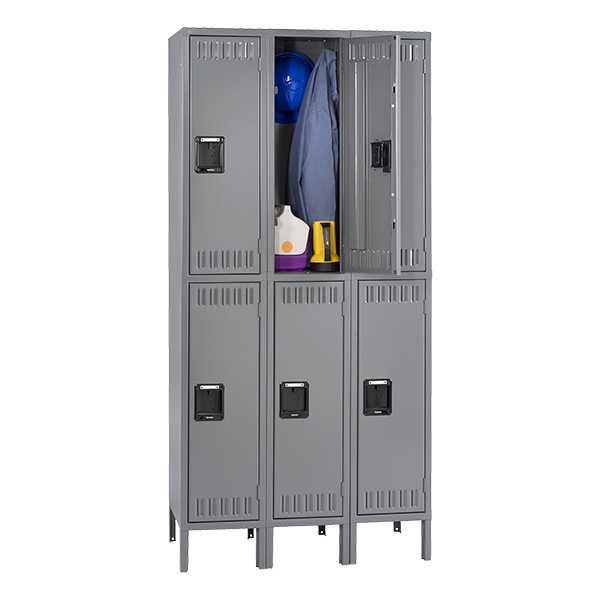 Ordering assembled lockers saves you time, while ordering unassembled lockers is less expensive. Remember, when you order assembled lockers, you'll still need to install them in your school. 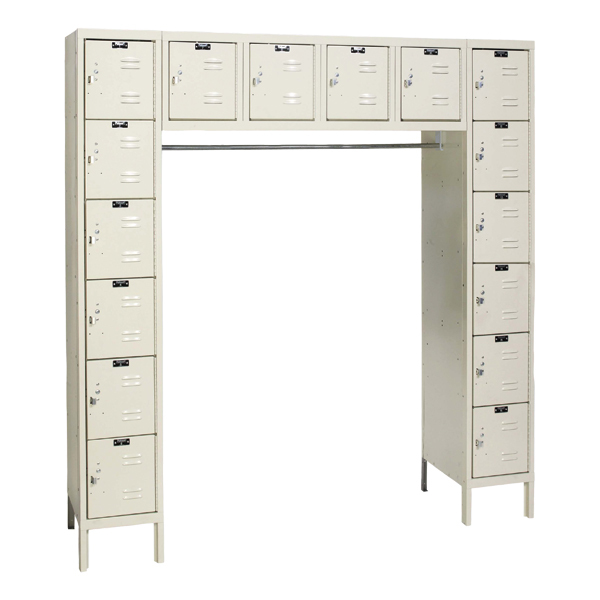 Locker units can have a one-column, three-column or specialty configuration. Since three-column lockers have one frame and share interior walls, they cannot be split apart. Specialty configurations include wall-mount lockers and other space saving designs. Depending on locker configuration and the number of tiers, or levels, locker units can house as few as one or as many as 18 openings. For example, a three-column, six-tiered locker unit will have 18 openings. The number of total openings is listed in the specifications for each locker unit. Is the handle recessed or not? Recessed handles won't snag students' bags or clothing, and they help protect the finish from being marred by padlocks. If your school lockers have non-recessed handles and you're concerned about protecting the finish, you'll want to make sure they have padlock strike plates. Another feature to consider is the locking method. Single-point locking is a method in which locking takes place only where the door latches. Multi-point locking, or three-point locking, typically uses movable rods to secure the top and bottom of the door as well. Finally, you'll want to consider what kind of locks your lockers will accept. Most lockers include a way to accept combination or padlocks, often with the addition of a simple padlocking hole. More modern designs use electronic keypads to store passwords for easy opening. Many school lockers include coat rods, coat hooks and hat shelves. Deeper lockers with fewer tiers tend to have more of these features than those that aren't as deep or have a lot of tiers. These features are listed in the specifications for each unit. Student lockers come standard with six inch legs. Keep in mind that there are often two height dimensions listed in the product specifications—one with legs and one without legs. Be sure to plan accordingly when measuring your space. Accessories give your lockers a finished look and help them best fit your space. Locker bases attach to locker legs to keep dirt and debris from collecting underneath your lockers. You'll find bases for the fronts and sides of your lockers. Slope tops prevent students from throwing trash and class materials on top of your school lockers. You'll also find slope ends that can be used at each end of a row of lockers to close off the open space on the sides of the slope. Some school lockers also include an option to purchase touch-up paint or add built-in combination locks or key locks. All of the accessories listed in this guide can be purchased here, in our Locker Room Benches & Accessories subcategory. Our friendly sales team can answer your locker questions and help you with a quote or phone order. Give us a call at 1-800-260-2776. It is best to have a sketch or layout of your room available so we can give you the most accurate quote. Click here to check out all of our school lockers.